United Airlines has unveiled new first class seats for its narrow-body airplanes. The airline has already upgraded some of its Airbus A319s, with plans to retrofit all of its A319s and A320s and some of its 737s and 757s throughout 2016. PriestmanGoode, a design firm, helped United develop the new seats, which are wider, with leather upholstery and other luxury features. During the design process, travelers were invited to try out prototypes and provide feedback. The larger seats measure 21.1 inches wide, have an adjustable headrest and come in United’s trademark colors, champagne and navy. 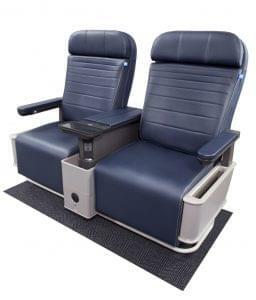 They have an articulating seat bottom that’s designed to make the seat more comfortable when it’s reclined. United will also upgrade the seats’ storage capabilities by adding side stowage for laptops and tablets, as well as a larger seat-back pocket. The tray table is new, too, and includes a patented built-in stand that cradles passengers’ smartphones and tablets. No more slipping and sliding in first class. The new seats also include universal A/C power outlets for charging your electronic devices, and new beverage holders and granite cocktail tables. This is just the beginning of upgrades that United is planning for its aircraft. The airline will also increase the size of overhead bins, offer more power outlets in all classes, install new carpets, add mood lighting, upgrade galley floors and play music at boarding.